Woody plants and turfgrasses are critical components of design plans for homes, offices, and parks. Trees and turf offer distinct personal, functional, and environmental benefits. Personal preferences for color, fragrance, and form should complement the functional properties of size, shape, density, and placement of plant material. We’ve all seen thinning grass under large shade trees, large surface tree roots that cause safety hazards and mowing obstacles, young trees that don’t seem to grow, and tree trunks badly damaged by lawn mowers or string trimmers. All of these undesirable effects can be caused by trees and turf growing too closely together. Turfgrasses, in addition to being environmentally beneficial, are attractive in formal and informal designs. There are many advantages to combining trees and turf in the landscape. When trees and turf are used in the same areas, extra attention must be given to plant material selection in addition to the usual hardiness, climatic, and soil needs. An effort should be made to make the trees and lawn compatible. Grass is generally a sun-loving plant. Most grass species will not grow well in areas that get less than 50 percent open sunlight; however, new varieties with improved shade tolerance are being introduced. Consult your garden center specialist or sod producer for recommendations of shade-tolerant grasses for your area. In areas where the lawn is the primary design feature, select woody plants that do the least damage to grass growth and maintenance. The woody plants should be small, have an open canopy (to allow sunlight to penetrate to the ground), or have a high canopy. 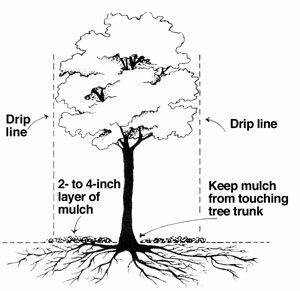 Select trees that do not root near the soil surface; surface rooting is most serious where shallow topsoil or composted clay soils are present. Remember, tree roots get larger as the tree gets older. Trees, shrubs, ground covers, and lawn grasses all require sunlight, water, and rooting space for growth. Each plant in the landscape competes with neighboring plants regardless of type or species. Some even produce chemicals that are exuded from roots to restrict growth of nearby plants. For each plant to do well, it must have adequate space. Because perennial woody plants increase in size each year, they require additional space over time. The landscape design should provide adequate space for these plants to mature. While shade is the biggest, most obvious problem trees create for turf growth, a tree’s roots also contribute to poor turf performance. Contrary to general thinking, most tree roots are in the top 2 feet of soil. More important, the majority of fine, water absorbing roots are in the top 6 inches of soil. Grass roots ordinarily occupy a much greater percentage of the soil volume than tree roots and outcompete them for water and nutrients, especially around young trees. However, grass root density is often much lower in areas where trees were established first. In these situations, tree roots compete much better for water and nutrients and prevent or reduce the success of establishing new turf. Competition is especially important when transplanting, seeding, or sodding. The newest plant in the area must be given special treatment and must receive adequate water, nutrients, and sunlight, which frequently means that competing sod should be removed from around transplanted trees and shrubs or that some of the lower branches should be removed from existing trees above a newly sodded lawn. In any case, do not do any tilling around trees. Maintenance practices for trees and turf are different. Because tree and grass roots exist together in the upper 6 to 8 inches of the topsoil, treatment of one may damage the other. Fertilizer applied to one plant will also be absorbed by the roots of a nearby plant. Normally that is good, but excessive fertilization of either trees or turf can result in tree crown or grass blade growth greater than desired. Many herbicides or weed killers that are used in turf can cause severe damage to trees when misapplied. Misapplication can occur on windy days, causing the drift to fall on nontarget plants, or on hot days when the herbicide may vaporize and diffuse into the air. While most herbicides do not kill tree roots, some, such as soil sterilants and a few others, do. Herbicides that can cause tree damage have statements on their labels warning against using the product near trees. Watering of lawns is beneficial to trees if the watering is done correctly. Trees need, on average, the equivalent of one inch of rain every seven to ten days, depending on the species. Tropical rain forest trees may require more. Frequent, shallow watering does not properly meet the needs of either trees or turf and can be harmful to both. 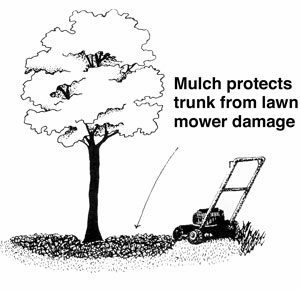 Turf growing under or near trees should be mowed at the top of its recommended mowing height. Mowing off no more than one-third of the grass blade’s height and letting the clippings remain on the lawn does much to ensure a healthy and vigorous lawn. In an ideal situation, tree and turf maintenance would be handled by the same individual in order to maximize the benefits of all maintenance practices. Placing fill dirt around existing trees. Fill dirt frequently is added around existing mature trees so that a level or more visually desirable lawn can be established. Fill dirt changes the ratio of oxygen to carbon dioxide around tree roots and the roots may subsequently die. 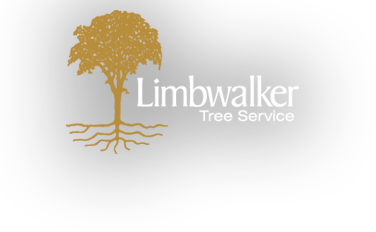 Consult a tree care expert before adding fill or constructing soil wells around tree trunks. Establishing lawns around existing trees. Preparation of a seedbed for lawns requires disruption of the upper 4 to 6 inches of topsoil. This soil contains the feeder roots of trees. Damage to tree roots often results in declining tree tops. Lawn watering in arid sites. Homes are sometimes built in woodlots. In arid regions, the watering that is required to maintain grass is especially damaging to dryland trees. Excess water at the tree trunk encourages growth of fungi that can kill trees. Thin turfgrass growing around trunk-scarred weak trees does not need to be a common sight in the landscape. With proper planning, proper plant selection and placement, and reasonable management, the many and varied benefits of both trees and turf can be readily achieved. © 2007 International Society of Arboriculture.